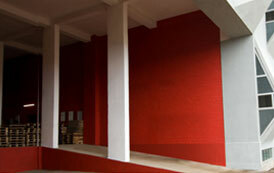 This warehouse sits in a fast developing commercial and industrial zone along a national highway near Mumbai. The environs are dotted with factories, storage facilities and office complexes. 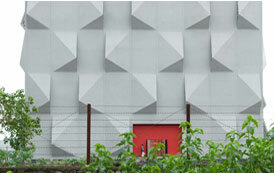 It has a three-dimensional façade on the otherwise box-like structure. The sculptural quality of the façade stands as a contrast to neighbouring buildings, whose facades are either glass curtains walls or repetitive patterns of small windows. This façade is conceived as a transmitter of daylight, minimizing the requirement for artificial lighting while also managing the intense heat and glare of the summer sun. The skin of the building is divided into vertical strips which fold outward in an alternating rhythm, allowing diffuse light to slip sideways into the large volume. The construction of the building is simple: a reinforced concrete frame with concrete block infill and exterior plaster. 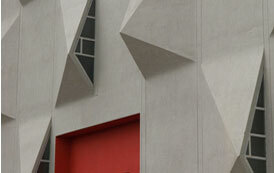 The construction of the folds in the façade posed the major structural and constructional challenge in the project. Folds have been created from a series of welded metal plates that have been sprayed with ‘gunite’ and then plastered smooth, allowing for speed of construction and a precision that is difficult to achieve in pre-cast concrete.